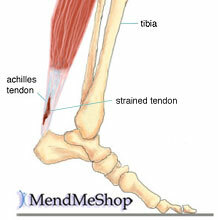 The Achilles tendon is an important part of the leg. It is located just behind and above the heel. It joins the heel bone to the calf muscles. Its function is to help in bending the foot downwards at the ankle (this movement is called plantar flexion by doctors). If the Achilles tendon is torn, this is called an Achilles tendon rupture. The tear may be either partial or complete. In a partial tear, the tendon is partly torn but still joined to the calf muscle. With complete tears, the tendon is completely torn so that the connection between the calf muscles and the ankle bone is lost. There are two treatment options available which are non-operative and operative. Non-operative treatment involves the use initially of a below-knee plaster with the foot held fully bent downwards. This usually stays in place for 2 weeks then is changed for a brace(this is a boot from the knee down to the toes with Velcro straps) which should be worn day and night. The brace will be regularly altered to allow the foot to come up to a more neutral position. The brace will be on for a further 6 weeks. After the 8 weeks you will be referred for physiotherapy to regain movement and calf strength but will probably need to wear the brace during the day for a further 4 weeks. Non-operative treatment avoids the risks of surgery but the risk of the tendon re-rupturing, which normally occurs within 3 months of discarding the brace, is 10%. Surgery for Achilles tendon rupture requires an operation to open the skin and physically suture (sew) the ends of the tendon back together, has a lower incidence of re-rupture than nonsurgical treatment. Allows return to pre-injury activities sooner and at a higher level of functioning with less shrinkage of muscle. Risks are associated with surgery, anesthesia, infection, skin breakdown, scarring, bleeding, accidental nerve injury, higher cost, and blood clots in the leg are possible after surgery. Surgery has been the treatment of choice for the competitive athlete or those with a high level of physical activity, for those with a delay in treatment or diagnosis, and for those whose tendons have ruptured again.